ALL Power Labs works with universities, high schools, and government institutes around the world to advance the science of gasification and help develop sustainable and renewable technologies. APL can help teachers and students alike build programs, set up research projects, and teach classes on a broad array of biomass thermal conversion processes. Always eager to support advances in the science and technology of not only gasification but of all carbon-lean biomass energy projects, APL offers continuing support to numerous academic and industrial research programs. This PP20 was purchased by DeNova, a waste recycling and reuse yard at the port of Frederiksværk, about 50 km northwest of the capital city of Copenhagen. They see it as a challenge to find value in what others may think is just trash, using modern techniques to sort waste into fractions that can be recycled or reused. 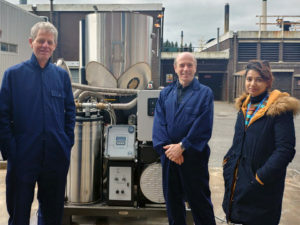 One way they hope to reuse biomass waste is by gasifying it. 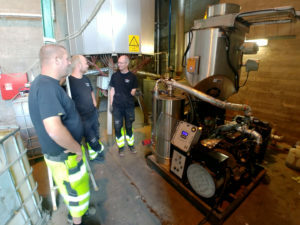 They plan to use their PP20 to explore how our efficient CHP systems can best fit into their mission to mine potential resources from the waste stream, trying to save the environment at the same time that they grow a successful waste-based business. Adding value by offsetting waste-disposal costs is an important part of APL’s design strategy. 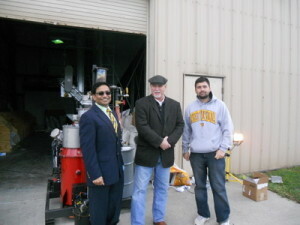 We installed a PP20 at UTM to be used for research into sustainable technology. UTM is a leading innovation-driven entrepreneurial research university and the largest postgraduate research university for technology in Malaysia. It has also established a reputation for innovative education and cutting-edge research, with a vision towards the development of creative human capital and the advancement of technological innovation. 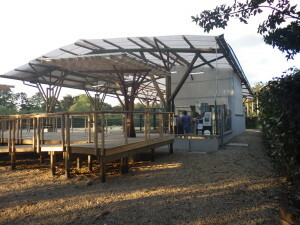 Two PP20 Power Pallets were installed in the José Celestino Mutis botanical garden. Located in Bogota, the Jardín Botánico is Colombia's largest botanical garden and serves both as a recreation and research center. Our biomass gensets are part of a program to create a sophisticated demonstration site featuring multiple forms of renewable power generation integrated into a micro-grid, which ties the PP20s to a solar array and an energy storage system. Their lovely facility is the focus of educational outreach surrounding environmental and conservations issues, as well as general science education for both children and adults. APL is pleased to be a part of this excellent program. 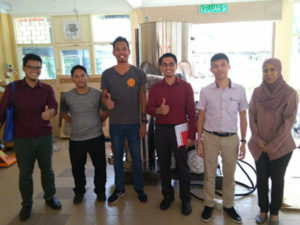 Using a PP20 v5 and working with university partners, Shenzhen Green & clear world Environmental Engineering (GEE) is developing a syngas-to-liquid reactor. Focusing on the commercialization of environmentally responsible projects, GEE's Power Pallet is part of a program to process municipal solid waste (MSW) into a transportation fuel. 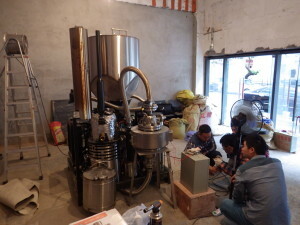 They are working to integrate their system into the solid-waste disposal chain of a large Chinese city to develop a product based on its specific local needs. GEE is using a proprietary catalytic system that promises to increase the yield of syngas and lower the temperature needed, while minimizing tar and other by-products. The ability to process MSW in our gasifiers is a long standing, but still remote goal for APL, and we welcome GEE's efforts to solve this difficult problem. 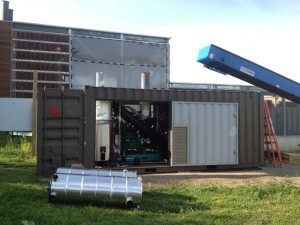 In a partnership with Cummins Inc., APL worked with University of Minnesota in Morris to develop a prototype shipping-container-based 100 kW genset running on Minnesota's plentiful agricultural waste corn cobs. With the help of a grant from the California Energy Commission, APL is currently partnered with University of California, Berkeley's Center for Forestry and their Renewable and Appropriate Energy Laboratory to develop this unit as a commercial genset: the 150 kW Powertainer. Our goal is to incentivize forest fire and bark beetle remediation in the Sierra Nevadas by creating a market for the forest waste as an energy resource. With one of the largest biomass renewable energy projects in the country, EIU students and faculty use their Power Pallet to do testing and research on biomass feedstocks and gasification. EIU Renewable Energy Center provides all the heating for the whole campus, using multiple biomass boilers to provide much of this energy. Their use of biomass gasification on a significant scale makes them an ideal site for an educational installation of an APL Power Pallet. Like so many other colleges and universities that have purchased Power Pallets, West Virginia University (UWV) uses our equipment to help their students do hands-on research and learning in their programs in agriculture, conservation and resource management. WVU's Davis College of Agriculture, Natural Resources and Design thousands of acres of farms and forests is uniquely situated to address important research in fields from food and shelter to energy and environmental protection. APL's first focus was in research and education, and we are proud of our relationship with institutions like UWV. 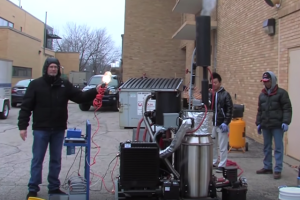 Eastern Illinois University uses the GEK PowerPallet to educate students about gasification. They have set up real time gas detection to analyze the wood gas while running the system. In this ~9 minute video, they walk through their experiences with start-up and running the PowerPallet and how it fits with their intentions to sustain their energy needs from local resources from consistent energy sources. Note that there is a good shot in the video showing the way we recommend sampling the wood gas from the system to ensure that condensate does not foul the analyzer equipment by attaching a long copper coil between the sampling port and the analyzer. It is recommended to include a small trap right before the gas analyzer. If you do have condensate, this can be collected for analysis as the liquid fraction by other means. 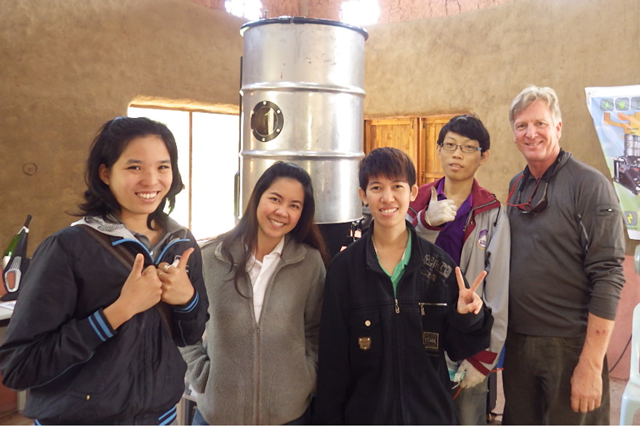 They are investigating a variety of their local feed stocks with the system and are looking into larger scale projects at their Renewable Energy Center. APL has been proud to assist all of the institutions below in using GEK Gasifiers in their research programs. If you don’t have any equipment yet, its best to match your GEK system with your educational goals. (We recommend contacting us at sales@allpowerlabs.org to ask about our current lead times so that we can be sure to get you set up before your semester starts). We are now selling a skid-based GEK kit intended for you to add your own engine and generator, or to generate producer gas for any other purpose. 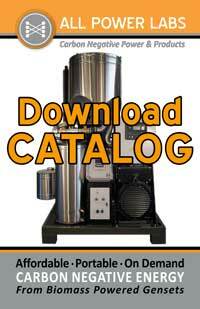 While our most current gasifier technology is no longer open source, plans, CAD files and instructions for all our earlier versions are still available from our wiki to allow you to begin research on gasifier design and engineering. We get many questions about where to set up the GEK Gasifier and Power Pallets for research purposes. Only operate or conduct maintenance on the GEK Gasifier or the Power Pallet in a well ventilated place. We have seen universities install hoods, negative pressure flues, or build a small single walled shed or roof structure to accommodate the equipment.